Mix all dry ingredients (including chocolate chips). Combine yolks and milk. Stir into dry ingredients. Stir in oil and mix. GENTLY fold in beaten egg whites, do not over mix. 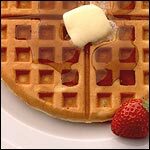 Pour about 1/2 cup at a time into waffle iron and cook according to your waffle iron's instructions. 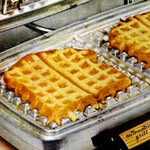 You can usually tell they are ready when steam stops coming out of the side of the waffle iron. 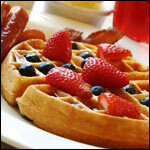 Some recipes tell you to sprinkle chocolate chips on the batter in the waffle iron. I find it works better when the chips are blended into the batter. Mr Breakfast would like to thank JSmith1223 for this recipe. 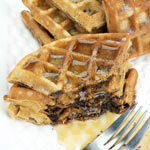 What do you think of Best Chocolate Chip Waffles? View all 37 comments for this recipe. I cut the vegetable oil (I used canola) to 1/3 cup and they were still crisp with no sticking. We're probably going to make them again next weekend. LOVE! 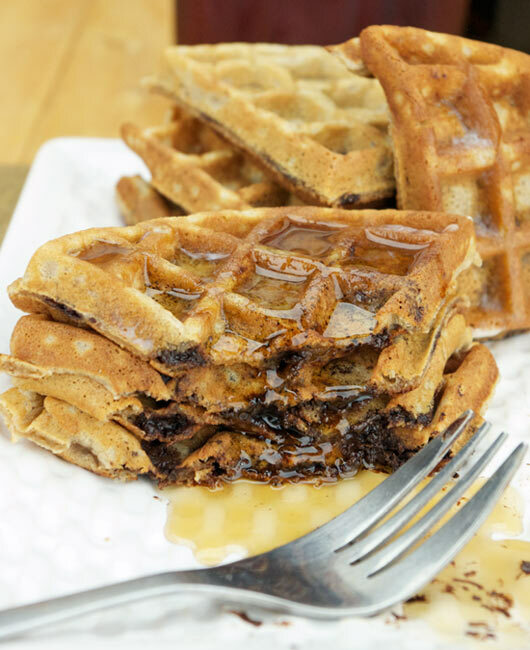 These truly are the BEST chocolate chip waffles! I first tried another recipe that took a little less prep and the result was mediocre. Decided to come back and try this one. It doesn't really take all that long to mix these up. Don't be intimidated by beating the egg whites until stiff. It's well worth it. These waffles are amazing! Love this recipe! Yes, I do heat maple syrup and butter and make whipped cream to put on top. So decadent and worth every mouthful. I put half the batter in the waffle maker, sprinkle the chips over that, then add the rest of the batter to avoid burning the chips. Works every time! My waffle iron burned the chocolate chips a little. So they weren't that great. My heat setting was probably too high. Absolutely wonderful! Very happy family this morning. Well, what do you do when you make a batter for waffles and your waffle iron dies... you make it in to Aebleskivers and roll them in powdered sugar! Worked great! They are yummy! :) Thanks for the recipe! I made these yesterday morning. Best waffles I've ever had! We made these waffles this morning and our waffles were delicious. There is enough sweetness with the chocolate chips that you do not even need butter on them to enjoy them. When I saw the 1/2 cup of oil, my poor arteries would not let me make the recipe as written. Instead, I used 2 Tablespoons of melted butter and the recipe turned out great. I can not say if the resulting waffles were better than the original recipe, but I was pleased not to have that much oil in my system. I also feel that this recipe worked great with 1 cup of chocolate chips instead of two, if you want to try and cut back on the calories per serving. Thanks for the starting point. I like it this way too. When you sprinkle the chips right into the batter in waffle maker, a couple of them always burn. This is the better way to to it. This is a great great great recipe! I used mini chocolate chips. I had to scoop them from the bottom so they were distributed evenly! But they are so good. I also added almond extract to them and made chocolate almond waffles! It might look hard to make but it's really not. It really tastes good and was worth the effort to make it. Reduce the chocolate chips in half (like others are saying) and this is a good recipe, otherwise it's just too decadent for breakfast - a great dessert though! Great waffles. I only used 1 cup of chocolate chips and it was plenty to get some chocolate in each bite. 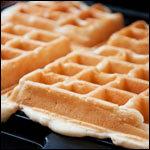 Stir up that batter before making each waffle so the the chocolate chips don't sink to the bottom of the mixing bowl. 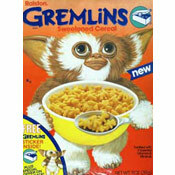 Good flavor and fluffy texture. Chocolate for breakfast! Yeah! Yum! Yum! Yum! Great recipe!